The first recipe that I selected is one from Searching for Spice. This recipe features one of my favourite ingredients, the full of flavour chorizo. I adore the depth of flavour that chorizo adds to a dish and this Easy Tomato and Chorizo Pasta is definitely going on my must try list and I know will be an instant hit with everyone here! The next recipe, from A Strong Coffee, features a mixture of Mediterranean flavours. Pesto from Italy, manchego from Spain, garlic, olives, sun dried tomatoes and the fantastically versatile courgette! This Courgetti with Pesto and Manchego is the perfect way to get extra vegetables into your diet. Spiralizers are a great addition to any kitchen and this post will tell you all about one that they have been trying there! The following recipe features yet more pesto. The Veg Space shared this Wholewheat Tagliatelle with Rocket and Hazelnut Pesto a dish that is simple yet so full of flavour. That is what makes pesto such an amazing ingredient, it adds so much flavour in such an easy way to any dish. The peppery flavours from the rocket will simply finish this pasta to perfection! Last but not least is this Leek Cauliflower Butterbean Freekah Salad with Sumac from Sneaky Veg. Freekah is a delicious ingredient that really is not used enough in my opinion. The green wheat adds a lovely nutty flavour to dishes and makes a great addition to both hot and cold salads. After reading this recipe I need to get some more on my next shopping trip! 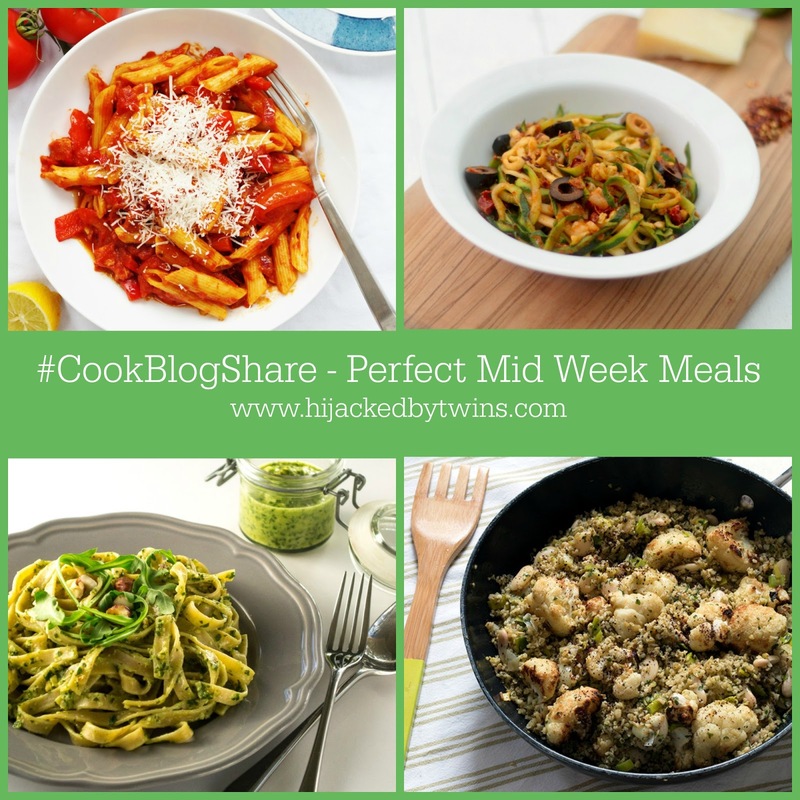 If you missed any of these great recipes last week, pop over and check them out! Now onto this weeks linky. Remember you can add any foodie posts, both old and new welcome. All that I do ask is that you comment on either this post or the post labelled HOST, comment on some of the other recipes that have been shared and display the badge below so that others can find us. As always I will be commenting on the posts during the week, tweeting, pinning and stumbling them! Now over to you, I cannot wait to see what you have been cooking up this week! Morning Kirsty! Happy Birthday to the twins! I love these mid week dinner ideas, they will certainly come in handy this week when things are a bit manic, as you say, with it being the half term. I am linking up my 2 recent recipes. A pancake recipe on its way:) Have a good week!